Manage more caregivers with fewer errors. CareFinder completes a complex matching algorithm and recommends qualified, available caregivers. Send open shift opportunities to one or multiple caregivers via email or text. Caregivers accept or decline the shift by replying on their phone or via email. The client details, tasks for the shift, and Google Maps directions are pushed to the Caregiver Portal and the ClearCareGo mobile app. Filter caregivers by more than 20 criteria, including distance, CNA, driver, availability, overtime, and client required and preferred criteria. Shift callouts are unpredictable. Your instincts are good, but with CareFinder you'll be great at placing the right caregiver - not just the first to pick up the phone. Once schedules are confirmed, shifts appear in the Family Room, the Caregiver Portal, and the mobile app. Shifts offered and caregiver replies are saved. Print a report to defend claims. Alerts you at the point of scheduling if a caregiver will hit overtime. The Live View Dashboard, available in either a weekly or daily view, makes it easy to monitor care in real time. The color-coded schedule quickly draws your attention to missed time clock events. Click to see shift details and contact information so you can take appropriate action immediately. When changes to the schedule take place, drag and drop single shifts or all future dates. Missed time clock events are color-coded, appear on your dashboard, and are emailed so you can act quickly. 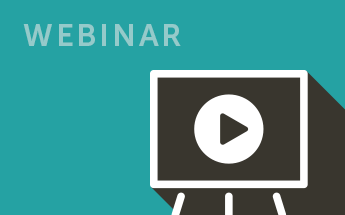 Display the Live View Dashboard on an office computer, tablet, or TV in the office. Respond immediately when late or missed clock-ins occur. 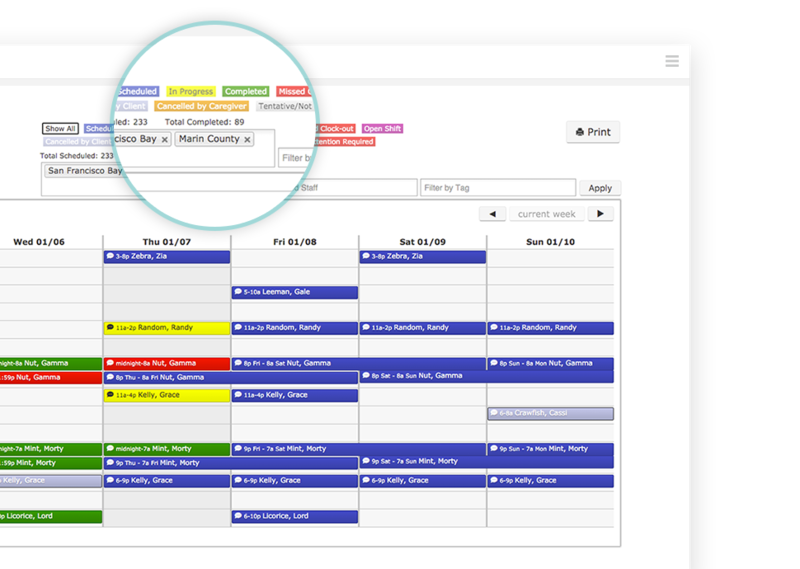 Tools for large agencies make bulk scheduling and changes a breeze. What is the difference between home health scheduling software and private duty scheduling software? Home care scheduling software supports private pay clients who need non-medical care. How do I prove shifts were offered to caregivers who are filing for unemployment benefits? 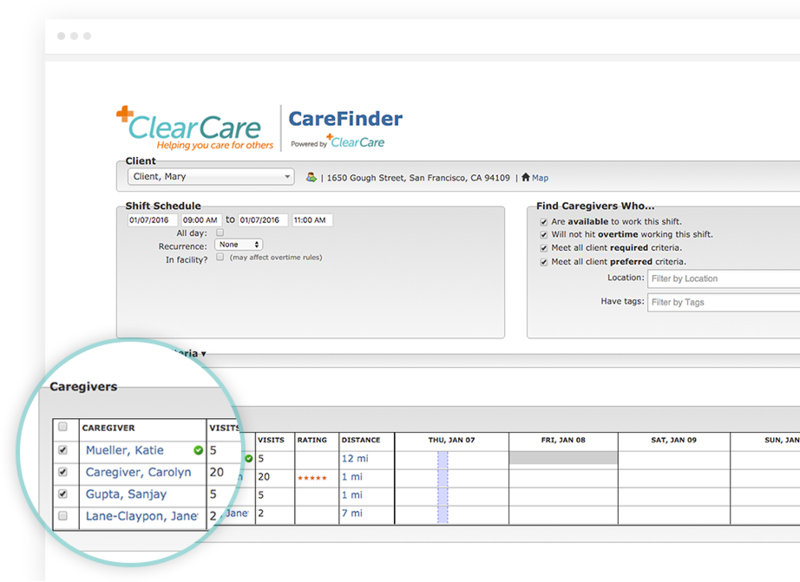 ClearCare's healthcare scheduling software records all shifts that were offered and the caregiver's response. Print or email a report for the dates in question to support your unemployment hearing. How do I determine pay rates during the scheduling process? Select default rates for each client or caregiver, or override if changes are needed. Instead of needing to click to the client and caregiver profiles, we make it easy and allow for pay changes while scheduling. Does the schedule appear in the Caregiver Portal/mobile app and The Family Room automatically? Yes! When a shift is confirmed, both the family and caregiver have automatic access to the schedule, shift notes, and the care plan. What is 2-way message threading? ClearCare's 2-way message threading allows an agency to send shift availability to caregivers via text, email, or both. Replies go to your inbox and in to the ClearCare system. 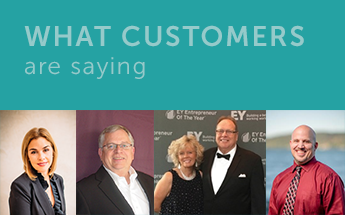 The ongoing conversation is recorded in ClearCare - even if you reply by email or the caregiver replies via text! How can I prevent scheduling caregivers more than 40 hours? Overtime alerts will notify the scheduler as soon as you pick the caregiver so you don't accidentally schedule caregivers who would be put into an overtime situation.